Here in the U.S., Minox does not have the name recognition or optics market share that it does in Europe, and we feel that change to both of those things is long overdue. 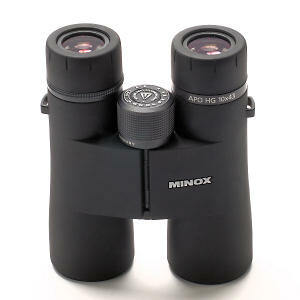 We were big fans of the Minox HG (“High Grade”) binocular line from the beginning. In late 2009, Minox upgraded the original HG line and re-released it. The new HGs have improved coatings and a significantly wider field of view. At the same time, Minox introduced two new binoculars that represent a significant improvement on the HG line and they are the focus of this review: the 8x43 and 10x43 Apo-HGs. The Apo-HGs improve on the already excellent optical performance of the HGs. 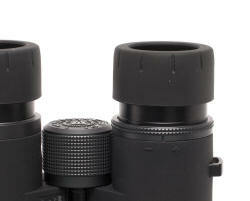 Simply put, the Apo-HGs are Minox’s bid to compete with the finest binoculars available today. If that’s the level of optic you are looking to purchase, you have to look at (or better yet, through) these! The Apo in the name refers to the apo-chromatic lens design, one in which the objective lens is comprised of several different-shaped lenses made of differing types of glass. These “extra” lenses re-focus the light that was prismatically separated upon passing through the first lens so that all the different wavelengths of light arrive at your eye at approximately the same point. In theory, the apo-chromatic design eliminates or drastically reduces chromatic aberration, resulting in sharper image quality with brighter, truer color. You can’t really tell this is happening when you look through the optic – all you perceive is clearer, crisper images with more brilliant color. We tested the Minox Apo-HGs against several top quality European binoculars in the same price class, and they definitely held their own for brightness and clarity (see below). Although the Apo-HGs look similar to the old HGs, the chassis are actually fairly different. These binoculars stand 6.3 inches tall with eyecups fully extended, and 5 inches across with the hinge all the way open, so they are bigger than the original HGs. The Apo-HGs retained the magnesium frames and matte black rubber armoring of the old HGs, but the aluminum accents of the focus knob and diopter ring are black. This is the only visible difference between the Apo-HGs and the new HGs, which kept the bright silver aluminum accents (it’s all about field marks, people!). The 8x43 Apo weighs 26.7 oz. with the rainguard and objective lens caps on, while the 10x43 Apo weighs 27.7 oz. in the same state. The rainguard and lens caps account for about 1.7 oz. Two points about this: first, even at this weight, the Apo-HGs are relatively light for a 43-mm HD glass binocular. Second, the Apo-HGs are so beautifully balanced that they feel lighter than they actually are. The rubber armoring has a wonderful texture that feels great in the hands and provides a firm grip. Shallow thumb grooves on the undersides of the barrels direct the hands to the balance point. We give them very high marks for their ergonomics. The Apo-HGs are completely sealed and dry-gas purged with argon (rather than nitrogen) to be waterproof, dust-proof and internally fog-proof. Argon is more chemically inert than nitrogen, and some manufacturers are using it instead. In other physical properties, the 8x43 Apo-HG has 19.3 mm of eye relief while the 10x43 model is somewhat shorter at 16.5 mm. Both should be adequate for most users. The interpupillary distance range of both models is 58-75 mm, meaning that these binoculars might not be as comfortable as some for people with unusually close-set eyes. Some major changes between the Apo-HGs and the old HGs are in the glass and coatings. The Apo-HGs are made with fluoride ED (Extra-low Dispersion) glass in the lens elements, manufactured by the Schott AG company, itself a subsidiary of their competitor optics company, Zeiss. This is the glass that provides the apochromatic performance. The prisms are made with BaK4 glass, which is industry-standard for this part of the optical system, and these provide maximum light transmission. The Apo-HGs have aspherical lenses that increase image sharpness. Like all optics manufacturers today, Minox has proprietary, high-tech coatings, each with a high-tech name designating it. Allow us to illuminate this for you… There are up to 21 layers of the M* lens coating which optimizes light transmission and color fidelity while minimizing light loss through unwanted reflection. The MINOTEC multi-coating of the exterior lens surfaces repels dust, dirt and water, making the lenses easier to clean and providing clearer viewing even in poor weather. This coating is unique to the Apo-HGs. MinoBright® is a silver-bearing coating of the prisms to ensure the highest possible light transmission for brighter, higher contrast images. One feature of the Apo-HG binoculars that particularly deserves praise is the focusing mechanism. When you focus an Apo-HG binocular on something, you will probably be surprised by how quickly and easily your target snaps to razor sharpness. The Apo-HGs have a differential speed focusing mechanism, meaning that the rate of speed at which the focus changes depends upon the distance you are from the target. The mechanism is finer at the short end of the spectrum, and adjusts at a higher pitch on more distant objects. The entire range from minimum close focus to infinity is traversed by a bit less than one full turn of the focus knob. While we’re at it, it’s worth noting that we measured the minimum close focus on the Apo-HGs at right about 7 feet for both models. While not the shortest minimum close focus out there, this is perfectly acceptable performance on this point, and the Apo-HGs achieve it with only minimal field collapse, which is good. A graduated scale of distance on the knob focus knob helps you estimate the distance in yards of the object you are focused on for anything between 2.7 and 50 yards. One area in which the Apo-HGs exceed the old HGs is their field of view. The 8x43 Apo-HG is listed as having a 379-foot field of view at 1000 yards, while the 10x43 models has a 342-foot field of view. This is a huge improvement in the 8x model, due at least in part to its dropping from 8.5x to 8x, as field of view is, to some extent, inversely proportional to magnification. But the increase in the 10x model’s field of view suggests a design change of some sort since the magnification remains unchanged in that model. Either way, both models of Apo-HGs provide better than average performance in field of view for their respective magnifications. The optical performance of a binocular is dependent upon many aspects of its design and manufacture. We’ve discussed many of these features already: the types and quality of the glass, the coating technology, the lens design, the type and physical arrangement of the prisms – all of these properties affect how bright and sharp the image is, the amount of contrast you perceive, the depth of field, the breadth of the field of view and the minimum close focus. Some of these, like field of view and minimum close focus can be measured with relative ease. Others like sharpness and depth of field are more difficult to quantitate. Image brightness can, with the appropriate machinery, be measured exactly though the resulting number is rather abstract. We contend that if you can’t perceive the difference, that difference, however real, is ultimately unimportant. For the most part, differences in brightness among the highest quality binoculars are very small. The Minox Apo-HGs compete very effectively with the high-end cohort in terms of image brightness. Likewise, the Apo-HGs lack nothing in terms of the image contrast or sharpness: they are excellent in both categories. We did note that the Apo-HGs have relatively little depth of field. Thus, the precision of the focusing mechanism is particularly important: the Apo-HGs compensate for less depth of field by allowing you to easily snap to a very sharp focus. We always talk about the two user-adjustable features: the eyecups and the diopter. The eyecups adjust to optimize position of the image cast by the binocular relative to your retina, to minimize eyestrain and prevent “blackout” – loss of part of the visual field. The eyecups of the Apo-HGs adjust with a helical counter-clockwise twist to extend them. There are two intermediate positions between fully in and out. All four positions are quite stable – they never collapsed inadvertantly during field use. The diopter adjustment is a locking aluminum ring at the base of the right ocular lens. To access the mechanism, pull the ring up to unlock it and twist it in either direction to adjust, and then push it back down to lock the adjusted position in place. Note, the right eyecup must be extended at least one position to permit adjustment – the ring cannot be unlocked if the eyecup is all the way down. We give Minox high grades for the simple and effective design of both these user adjustable features. 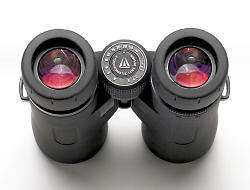 There are many peripherals that come with Minox Apo-HG binoculars. The strap is the usual hybrid of black cordura joined to foam a padded foam rubber section that provides comfort on the neck. This is fine as far as it goes and provides adequate comfort, though we still prefer and recommend purchase of a separate harness. The rainguard is essentially unchanged from the old HGs: two fairly deep cups of pliant black rubber, joined by a flexible bridge region. These cups fit snugly over the eyecups and are not dislodged by inverting and shaking the binocular. A single bracket on the right-hand cup allows the user to thread the strap through if they wish. The rubber objective lens caps are tethered to rings that encircle the barrels. The rings are tight enough that we didn’t accidentally dislodge any during field testing. The lens caps fit firmly over the rubber armoring of the objective barrel ends, with little tabs on the caps to assist in removing them. We noted that the objective lens caps sometimes close on their own against the user’s chest, but this is a trivial point. These objective lens caps are vastly improved over what the old HGs had. By contrast, we were disappointed with the soft case. The Apo-HGs come with a padded, felt-lined leather soft case with a magnetic closure to the flap. The problem is that it only fits the binocular easily with the eyecups rolled all the way down, and the rainguard and objective lens caps removed. You can get the binocular in with the rainguard and lens caps in place and the eyecups rolled down, but the closure is under strain in that condition. Had Minox made this case just a tad bigger, we’d have given them better marks for this. The field case has no strap of its own, but it does have a belt attachment loop. Notice how we keep saying “soft case”? This is because the Apo-HGs come with a beautiful wooden hard case lined with off-white cloth and a binocular-shaped depression inside it. Opening the lid causes a tray inside to slide up to an inclined position to display the binocular. This is less a hard case than it is artwork! The last extra Minox provided is really neat: a cleaning kit comprised of a micro-fiber cloth, a lens pen and a bottle of anti-fog cleaning fluid. This all comes packaged in a double-zippered leather case with a belt loop attachment. This is really useful and a great extra! One change that you won’t be aware of is where Minox Apo-HG binoculars are manufactured. The HG binoculars used to be made in Asia, which helped keep costs down. Now, manufacture of the HG and Apo-HG lines has moved to Germany, where they have better control over quality, but higher production costs. That along with the intrinsically more expensive design and materials means that the price of the Apo-HGs is $1,900.00, for the 8x43 and $2,000.00 for the 10x43. We think you are getting a lot of binocular for the money, and there are some really great features and peripherals that come along with it. Are they the last binocular you’ll ever need? Maybe. Certainly if you are looking for that “last“ binocular, you really should look at the Apo-HGs – we think you’ll like what you see. This item has been discontinued. Please check back for a replacement when available.